Whether you have been stitching hardanger patterns for years or have just completed my learn hardanger free course of lessons, this selection of designs will delight and perhaps surprise you. I chart my designs so that each graph line represents one fabric thread making them easy to follow. 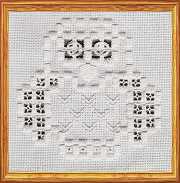 The hardanger owl comes complete with full step by step instructions so that even a beginner can tackle it. Although geometric by nature there is nothing to say that the kloster blocks in hardanger embroidery cannot be arranged to make a picture! This little hardanger owl is always a hit at the workshops I teach locally and is simple to stitch. The diagrams and instructions will show you how to work the kloster blocks, doves eyes, needleweaving, eyelets, cable stitch, buttonholed eyes and fishbone stitch (for his beak). This festive design, worked in red, green and gold, will brighten your Christmas table. It is simple to stitch using just kloster blocks, needleweaving, doves eyes and eyelets. What would your wish be? No, don't tell me or it won't come true! 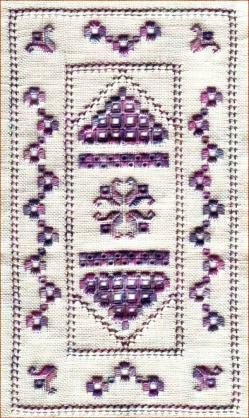 Whether you frame it or make it into a bellpull this hardanger pattern is sure to delight. Instructions are included for satin stitch and kloster blocks, cutting and needleweaving, four sided stitch and a buttonholed wheel. 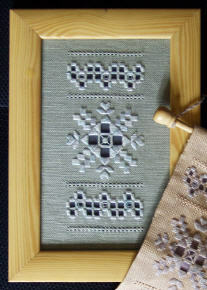 I also include tips on how to make the project into a hardanger bellpull. 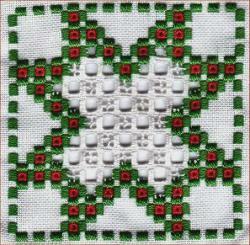 Kloster blocks form daisy chains inside a four sided stitch border on this design. Surface embroidery is used for the motifs, along with eyelets. Needleweaving and square filets decorate the openwork areas. 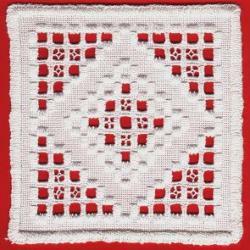 This versatile hardanger pattern can be used as a small table runner, it can be framed or finished as a bellpull. The model in the photograph was stitched in Oliver Twists Hardanger Hanks on 32 count linen. 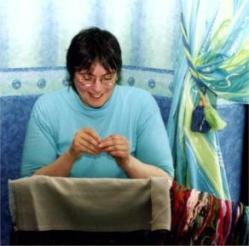 Why not make something practical while you are learning hardanger embroidery? This simple little mat uses just kloster blocks, cutting and needleweaving and doves eyes, all clearly explained with accompanying pictures. I understand that you will use my information to send me the Stitchin' Time newsletter occasionally. You can unsubscribe at any time using the link at the end of every issue. Text and images contained within this site are not authorized to be traded, given, received or sold for points, gold coins or for any other form of monetary value. 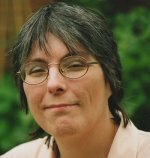 Nor are they authorized to be placed on any website, book, magazine, page or forum. Please do not copy the content of this site. It is protected by Copyscape.